Determine the length of the arc given by the parametric equations $x = \cos t$ and $y = \sin t$ on the interval $0 ≤ t ≤ 2\pi$. We note that these parametric equations yield a circle with radius $1$ since $x^2 + y^2 = \cos ^2 t + \sin ^2 t = 1$. Hence we should expect that the circumference of this circle to be $2\pi r = 2\pi$. Now let's verify it using the formula we just obtained. 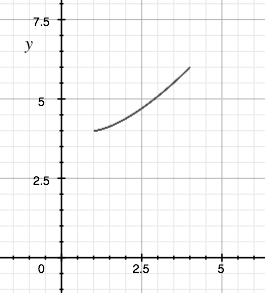 Find the length of the curve given by the parametric equations $x = 1 + 3t^2$ and $y = 4 + 2t^3$ for $0 ≤ t ≤ 1$.